À la carte wisdom from the international bestseller Bringing up Bébé. Bringing Up Bébé started an international conversation about the wisdom of French parenting by offering an inside look at a society where children are typically good sleepers, gourmet eaters, and generally well behaved. Journalist and mother Pamela Druckerman set out to understand how French parents achieve such results – while staying so calm. Meanwhile, Druckerman shared the story of her own young family’s life in France. Instead of just two magic words, teach children four: hello, goodbye, please, and thank you. Follow the French food rules: Kids eat only at mealtimes or the once-a-day snack. Vegetables come first. Picky eating is not an option – kids have to taste everything. Give children as much freedom as possible—and free yourself by not scheduling lots of activities. Don’t be afraid to say a firm “no,” but say “yes” as often as you can. 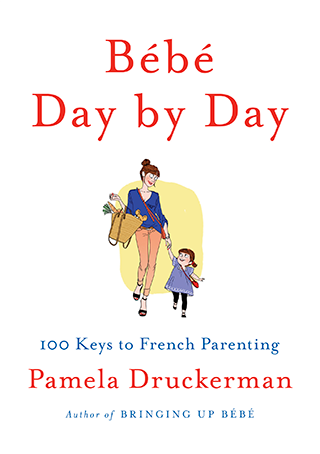 Divided into ten sections, including sleeping, eating, and motherhood, Bébé Day by Day offers the time-tested lessons of French parenting followed by a brief discussion of each. Alongside are recipes from a typical French daycare menu for toddlers—complete with cheese course. The book will feature line drawings by noted French illustrator Margaux Motin, who illustrated the jacket of Bringing Up Bébé. This little book of lessons will help American parents reclaim a common-sense era of family life that is still the norm in France. Its timeless advice, written in pithy, practical prose, will be appreciated by parents and grandparents alike.